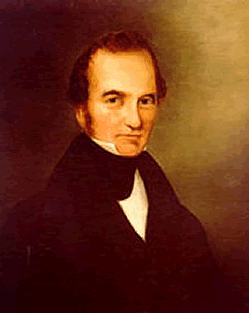 Stephen F. Austin established what has become the traditional founding year of the Texas Rangers in a call-to-arms written in 1823. It was inscribed on the back of a recycled handout published in August. The text is reproduced below in its entirety. A few months before Austin’s call, Jose Trespalacios, the respected Governor of Tejas, approved the formation of a small militia force to protect settlers in the Mexican province from marauding Indians. Settlers faced Comanches, Tonkawas and others on horseback who knew the land, struck quickly and disappeared. It was an ancient pattern of guerrilla warfare that would last another fifty years in Texas. Commanded by Lt. Moses Morrison, the Texas militia was too small, untrained and poorly equipped to do much good. History records that the they sometimes took to the field on foot with fife and drum. Tejas was vast, communications were poor and roads were muddy trails. Word of a raid sometimes took days to reach help. As representative of Mexico, Austin personally undertook the reorganization of the militia into ranging men or Rangers. He issued a call for an additional 10 men to merge with the Morrison militia and paid them in grants of land. Anglo-European frontiersmen, Mexican vaqueros and friendly Indians were blended into a potent fighting force of Ranging Men. Without them, the settlements in Tejas would likely have been abandoned. Since the commencement of this Colony no labor or expense has been spared on my part towards its organization, benefit and security— And I shall always be ready and willing to risk my health, my property or my life for the common advantage of those who have embarked with me in this enterprise. As proof of the reality of this declaration I have determined to augment at my own private expense the company of men which was raised by order of the late Governor Trespalacios for the defense of the Colony against hostile Indians. I therefore by these presents give public notice that I will employ ten men in addition to those employed by the Government to act as rangers for the common defense.